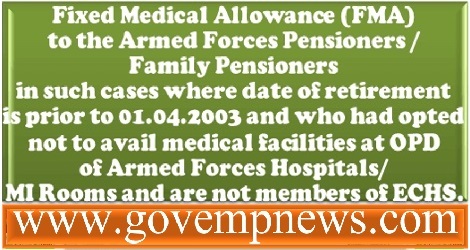 7th CPC: Fixed Medical Allowance (FMA) to Armed Forces Pensioners/ Family Pensioner retired before 01.04.2003; Office of the Principal CDA(Pensions), Draupadi Ghat, Allahabad-211014, Circular No. 586, Dated: 25th September, 2017, Subject: Grant of Fixed Medical Allowance (FMA) to the Armed Forces Pensioners/ Family Pensioners in such cases where date of retirement is prior to 01.04.2003 and who had opted not to avail medical facilities at OPD of Armed Forces Hospitals/ MI Rooms and are not members of ECHS. Reference: 1). This office Circular No. 544 dated 04.06.2015, Circular No. 451 dated 21.02.2011 and Circular No. 208 dated 27.07.1998. 2). GOI, MoD letter No. 1(10)/2009-D(Pen/Policy) dated 29th August’ 2017. How Calcutta command hospital can advice a 83 years old pensioner retired in 1986 when ECHS was not formed and opted for medical allowance.He was refused asentitled pensioner for admission ?